According to the Centre for Biological Diversity, the Endangered Species Act�s science-based mandate for delisting was sidestepped for political expediency. (b) PURPOSES.�The purposes of this Act are to provide a means whereby the ecosystems upon which endangered species and threatened species depend may be conserved, to provide a program for the conservation of such endangered species and threatened species, and to take such steps as may be appropriate to achieve the purposes of the treaties and conventions set forth in subsection (a) of this section. (3) The terms ��conserve,�� ��conserving,�� and ��conservation�� mean to use and the use of all methods and procedures which are necessary to bring any endangered species or threatened species to the point at which the measures provided pursuant to this Act are no longer necessary. Such methods and procedures include, but are not limited to, all activities associated with scientific resources management such as research, census, law enforcement, habitat acquisition and maintenance, propagation, live trapping, and transplantation, and, in the extraordinary case where population pressures within a given ecosystem cannot be otherwise relieved, may include regulated taking. As the second point says: "... the use of all methods and procedures which are necessary to bring any endangered species or threatened species to the point at which the measures provided ...are no longer necessary. Such methods and procedures include, but are not limited to, all activities associated with scientific resources management such as research, census, law enforcement, habitat acquisition and maintenance, propagation, live trapping, and transplantation..."
At the sessions with USFW where the issue of wolf protections were discussed, there was not scientific input, and decisions were made by local USFW officials. Below is a link to a petition requesting that Fish and Wildlife Service Director Dan Ashe extend the comment period and hold public hearings in five key cities within regions where so much more can be done to recover wolves to our national landscape. Please sign. Wolves are such an important part of the ecosystem and we need them. Thanks to Mitchell D who came across this and asked me to publish it. Thank you for taking action on "Give Wolves a Fighting Chance." Your letter will be delivered to U.S. Fish and Wildlife Service Director Dan Ashe. Thanks Lynn, hope this helps! Poor wolves. Thank you for taking action on "Give Wolves a Fighting Chance." Your letter will be delivered to U.S. Fish and Wildlife Service Director Dan Ashe. Signed & Noted & Thanks for posting Lynn. It's about ranchers, herders, and hunters not about animals who need to be protected. Thank you for taking action on "Stop the Plan to Slaughter Wolves." Your letter will be delivered to the U.S. Fish and Wildlife Service. Where do we sign? I went to the link but didn't see anything except the statement. If the trend continues, most people will decide to skip college altogether. Money talks and knowledge stinks... That appears to be the motto in good, old USA! The petition link is near the bottom of Lynn's first post on this thread. People. PLEASE spread this around to as many of your contacts as possible. The improper method used by the gov't agency to do the de-listing may just be the vulnerability we need to pounce upon! signed, thank you Lynn for the petition site. Signed. For the sake of "political expediency", we should expediently move some politicians and appointees out of office. Noted and signed. Thanks, Lynn. It's a tragedy our country is repeating; annihilating all the wolves, thinking this is the answer to their problems. And all they're really doing is destroying the ecosystem and the environment where wolves are a necessity. Science has proven this. "Those who ignore history are doomed to repeat it." Signed & noted. Thanks, Lynn. Hmmmm...could money have been involved here? Whoever made the decisions, and for whatever reasons they were made, they are bad decisions and need to be reversed. Have already signed several petitions and of course signed this one too. We all know who is behind the fish and game agencies right? Ranchers who want the OK to kill off these beautiful animals that are part of nature's plan. Will gladly sign the petition with hope for the wolves in all states. thanks Lynn for giving us the link to the petition. Signed. No surprise, but important to realize - and resist. Does anyone doubt that the Fish and Wildlife Service is a corrupt branch of the US gov't and is run by hunters for hunters? These people have got to go. Noted - I guess this proves that the Fish & Wildlife Service doesn't work for the people who pay their salaries. Who gave them the right to hand over "the reins"?? Getting so angry over the government agencies making decisions without the actual authority to do so. So sick of it! Thank you Kenneth, I couldn't find the petition!! Bribes from ranchers and their lobbyists are the problem. Delisting wolves is wrong and totally stupid but there you go we're talking money not sense. Typical and vile. Signed - many thanks Lynn. 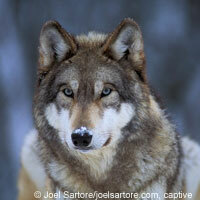 signed and noted, what a sad place this world will be if the wolves are eradicated. What will our descendants think of us if we do not stop the madness?